Since 1941, M&M'S have been a favorite at parties, in candy buffets and at the office. Made with peanuts and real milk chocolate covered in a crunchy candy shell, this delicious candy is great for baking into your favorite treats and desserts. A classic candy, these fun packs make great handouts and additions to your party favor bags. The little packets are great to keep on hand for slipping into lunch boxes, too! Buy in bulk to save money. Approximately 24 pcs per pound. Includes 3 lbs. Resealable bag for easy storage. Great candy that will be loved by kids of all ages (and adults too). Enjoy these sweet treats with many enticing flavors of the classic candy you crave. Individually wrapped. Kosher. Items are repackaged in a facility that may contain milk, soy, peanuts, tree nuts, eggs, wheat and all other allergens. Since 1941, M&M'S have been a favorite at parties, in candy buffets and at the office. 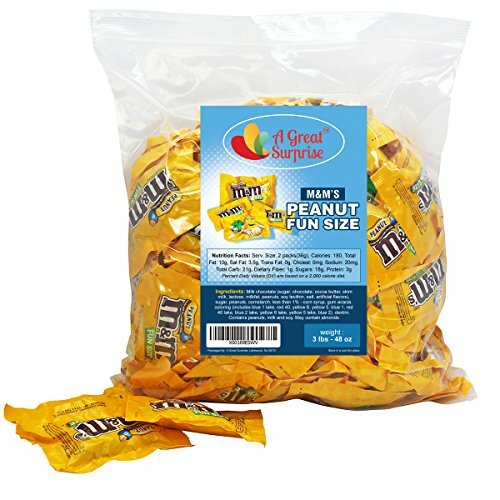 Made with peanuts and real milk chocolate covered in a crunchy candy shell, this delicious candy is great for baking into your favorite treats and desserts. A classic candy, these fun packs make great handouts and additions to your party favor bags. The little packets are great to keep on hand for slipping into lunch boxes, too! Buy in bulk to save money. Approximately 24 pcs per pound. Includes 3 lbs. Resealable bag for easy storage. Individually wrapped. Kosher. Items are repackaged in a facility that may contain milk, soy, peanuts, tree nuts, eggs, wheat and all other allergens.